Photo courtesy of Jo Ellen Arney. From Sodus Point and Sodus Bay in the 20th Century by Alan Firstone (Chris Arney), Page 51. 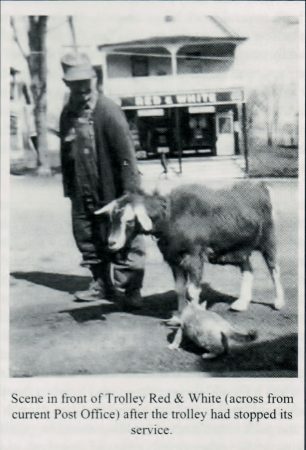 The Red and White Grocery Store (sometimes called the Trolley Red and White during the days of the trolley) was located across the street from what is now the Post office. It is believed to have been in operations from the 1920s until the 1960s when it was converted into apartments. For many years it was owned and run by Bill and Florence Albert. Pete Jimerson remembers: I remember the red and white. Owned and operated by Bill and Florence Albert. Grandparents of Esther Catchpole. Bill home delivered groceries as most of us didn’t have a car. Bill was a fine man. Marie DeWispelare remembers: I remember it also Pete. Yes the building next to the Bay Street. Owned by Bill Alberts who was the grand father of Esther Bohrer Catchpole. Rick Reynolds remembers: Walt Bohrer is my Grandfather and I remember as a kid that I would help him with repairs in the apartments. Sheryl Burnette remembers: I lived in the apartment above the store in the early 50’s. And then again in the bottom front apartment in the early 60’s when it was turned into three apartments. Richard Bennett remembers: I remember it well. If I remember correctly, you took your list in and Mr. Albert’s had to get your stuff for you. All you had to do was stand by the counter. Don Ward remembers: Where the meat and cheese was wrapped and tied from a large roll of white paper. The toilet paper was way up on the top shelf, which was retrieved by a long stick.